Simply, enter your name and email address below to recieve this newsletter quarterly. With the critical need for businesses to compete in an ever-changing world have you considered what your people need in skills to position you as a market leader? Every organisation needs a master plan! That plan needs to be flexible to meet changes in the economy as well as each of our markets. Having skilled managers that can identify performers and those that are future valued resources of the organisation is invaluable. Managers need ongoing education to assist them in identifying skills for staff to future proof the business. Not just IT skills! The skills with vision to predict relevant industry opportunities provide an edge to the business. Call us to discuss how we can develop a program covering Information Technology and Professional Development training for your people! COMPANIES CHOOSE NEW EMPLOYEES INSTEAD OF TRAINING THEIR STAFF! In a recent newspaper article based on a survey of over 400 company managers it confirmed the preferred option was to hire new staff rather than train their own people. It was also noted as technology becomes more embedded in businesses more employees will require upskilling. Businesses need to identify the skills they need not just for today, but also for the future! If organisations invest in specialised training for their people this will set themselves up for growth by developing an agile workforce for the future! It was also noted that training was most valuable in retaining highperforming staff with some 20% of respondents confirming it was an effective tool to prevent employee churn! In summary, investing in your staff development provides massive savings in recruitment costs. Combining specific work related skills and management capability will provide the best return. Give us a call so that we can provide a consultation to discuss how we can put in place a leadership develop program for your organisations! Congratulations to all Commonwealth Games competitors on your great performances. 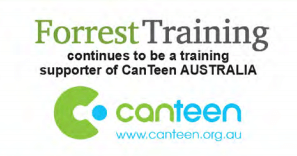 FORREST TRAINING CENTRE NOW UPDATED! We have purchased new training systems with state-of-the-art hardware that is connected to a new Training Server running Microsoft Server 2016. After extensive system testing from various hardware vendors the choice to go with Dell was clear. All of our new Dell systems are configured with a fast Intel Core i7 processor, 16GB of RAM and fast SSD hard drives that support Windows 10 providing our participants with business grade performance. The new systems are a perfect complement to our recently updated Internet connection to the NBN which provides an experience second to none! To support all of this new technology we have installed Epson data projectors connected via HDMI. With all our rooms having natural light and ergonomic furniture we are providing a perfect learning environment for all clients. Call us to organise a meeting to discuss how we can provide a cost-effective solution? for Nature Australia, and the Australian National Maritime Museum.